Camphill’s dairy products have long had a dedicated following in and around Cape Town, especially our full cream yoghurt, rich with the creaminess of the milk from our Jersey-cross cows. We are currently supplying Gouda and Cheddar cheeses, as well as our quark, labaneh and feta, and of course our milk and yoghurts, to a selected range of Cape Town retailers. You can also visit us, tour the farm on a tractor ride and buy direct at our monthly markets. Many of our new customers are looking for sustainably and ethically produced dairy products. Increasingly we’re asked for more details of our dairy practices, so we’ve put together the most frequently asked questions. Thanks to Josh Burgener for submitting this detailed list of questions to start off our FAQ. What are the conditions like that the cows are kept in? Where do they feed? The cows graze on our pastures. We have a farm of 220ha, and of that, about 35ha of pastures. They spend all of the time outdoors, in pastures, except when they are milked. They are collected from the fields and milked twice a day, mornings and afternoons. What is their diet comprised of? Are they entirely pasture raised or is their diet supplemented by grains etc.? In winter it is a combination of natural winter grass, serredella, kweek, and kikuyu. We also have fields of oats for winter grazing. While they are being milked, their food is supplemented with a feed which consists of non-GMO maize, molasses and Lucerne, and straw. We grow barley and lucerne which we bale for summer fodder supplement feeding. How are the cows milked? The cows are milked with machine clusters, eight at a time. What happens to those cows that are no longer producing milk? Cows that are no longer milk producing we sell on auction. How do you ensure that the dairy-producing cows keep producing milk? How are the dairy cows impregnated? We do not do artificial insemination. We have two bulls that are part of the herd of cows in milk, and each cow has a calf every year to ensure it stays in milk. What happens to the male calves? 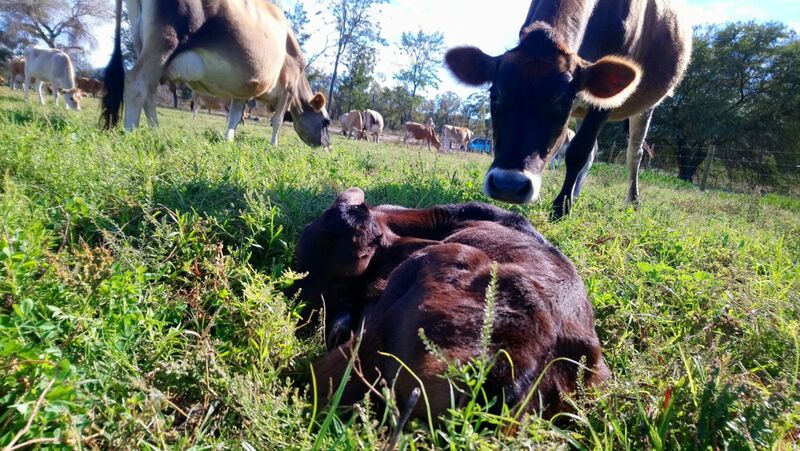 What happens to the female calves? 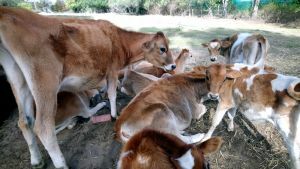 The calves stay with their mothers for 2 months. Thereafter we sell the male calves to one of our staff who raises them as bulls. The female calves we raise to be our future herd. What happens to the animal waste produced? How are the pastures and plants fertilised?